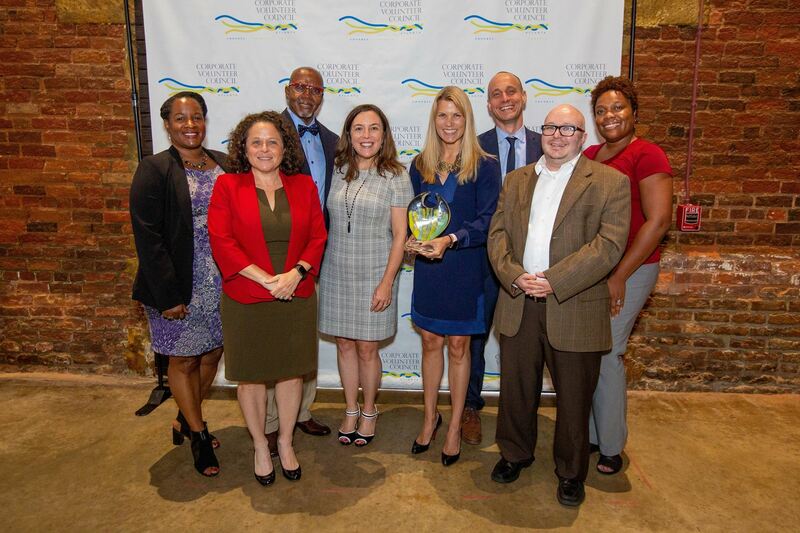 The 21st Annual Corporate Volunteer Council of Atlanta (CVC) IMPACT Awards were held on September 12, 2018, at the Georgia Freight Depot in downtown Atlanta. 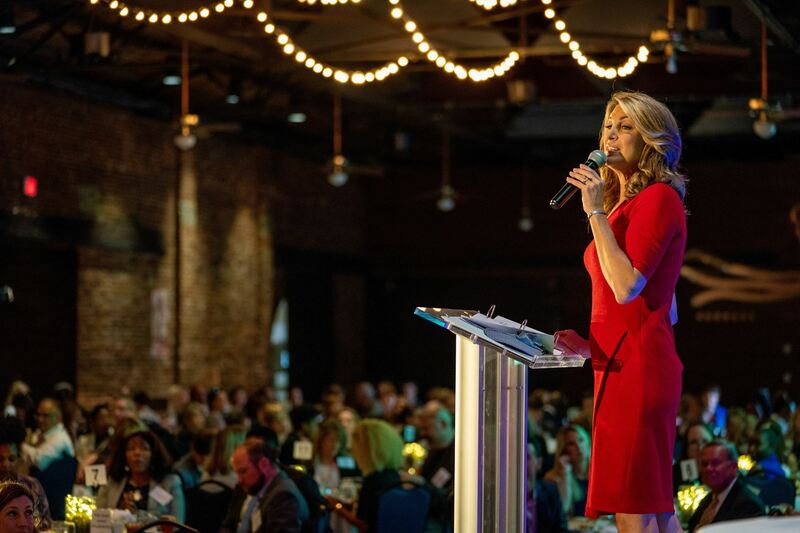 11Alive News Anchor Cheryl Preheim led us through the program and announced our IMPACT Award winners. 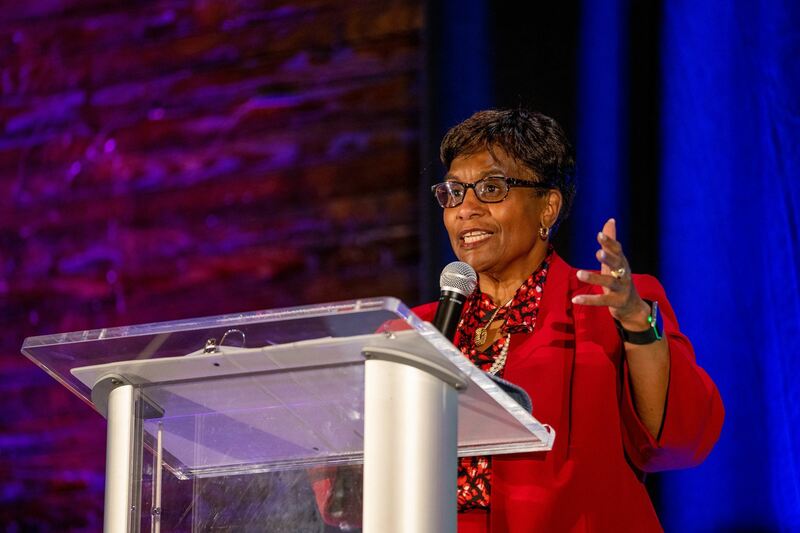 Beverly Thomas, Vice President of Communications and Public Affairs at Kaiser Permanente, updated us on Kaiser Permanente's impressive community investment and partnership activities. She then introduced our keynote speaker, Roy Spence of The Purpose Institute. Roy is also the chairman and co-founder of the advertising agency GSD&M and author of It's Not What You Sell, It's What You Stand For: Why Every Extraordinary Business is Driven by Purpose. Roy captivated our audience with inspiration and lessons on finding your personal and professional purpose. 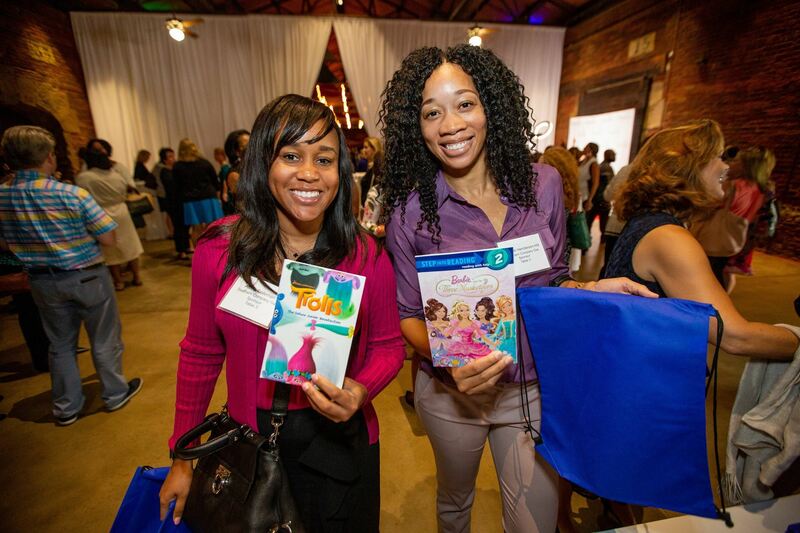 At the event, Hands On Atlanta hosted a literacy kit build where attendees assembled 200 kits for students at Atlanta Public Schools near downtown. 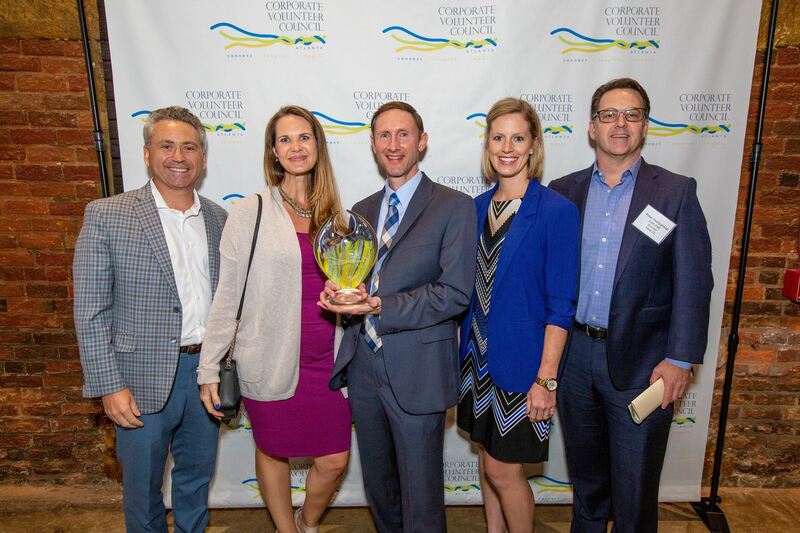 Special thank you to our partner, the Atlanta Business Chronicle, who created and published a special insert highlighting the good work of CVC companies and member partners. Click here to view the electronic version! Thank you to all of our attendees who made the event such a success! Click here to view the full photo gallery from the event. All photos are courtesy of Rank Studios. On October 5, 2017, over 2,000 Atlanta-based Turner employees worked roughly 6,750 volunteer hours as part of Turner Volunteer Day, the company’s annual day of service. Employees participated in 47 volunteer projects, including preparing meals, building homes, painting murals, making blankets, and landscaping spaces, which benefitted 33 different nonprofits. Turner Volunteer Day, which originated in Atlanta 18 years ago, has now grown to a global company initiative with over 3,300 employees volunteering in 30 cities and 20 countries across the globe. Kilpatrick Townsend launched its multi-faceted partnership with the Atlanta Volunteer Lawyers Foundation (AVLF) and Barack and Michelle Obama Academy (BAMO) at the start of the 2017-2018 school year. As a part of its Standing With Our Neighbors initiative, AVLF has embedded a lawyer at the school who helps families with legal problems affecting the stability and safety of their housing. This year, the firm partnered with AVLF and represented 10 households in legal disputes that affected the stability and health or safety of their rental housing including successfully defending residents facing dislocation from their housing units just one month before the end of the school year. Volunteers focused additional efforts on academic enrichment and college/career readiness via virtual weekly reading tutoring for first graders, annual K-2 reading days, STEM-focused projects, and student incentives, and recognition as well as school beautification, teacher appreciation, and support of student families in crisis. The partnership between Gas South and Cobb EMC strives to impact local students within the surrounding areas by focusing on improving education in the areas of literacy and STEM (science, technology, engineering and math). Volunteers work together on two different programs: Literacy Week where authors come into more than 44 local schools to encourage students to expand their creativity through writing and illustration; and The Regional Science Olympiad Tournaments that are focused on STEM and teach students how to problem-solve. The two programs reach over 24,000 students at 150 schools. Not only are they touching the lives of so many students at the actual events, the students’ curriculums are brought to life through experiences that they would not normally be exposed to. Both companies are focused on elevating our community to help children succeed. The amount of resources leveraged in terms of monetary investment, staff and volunteerism, etc. is greater by working together. In partnership with two technology focused non-profits, 48in48 & TAG Education Collaborative, the Student Immersion Program provides metro Atlanta high school students with the opportunity to develop their technology skills, work alongside industry experts and give back to the community. The program gives student participants real world project experience and presents examples of how professionals can devote their time and talent to improving our communities. Purchasing Power has have nine super powers embedded into their culture, one of which is Care. This is how Purchasing Power defines their Care super power: “What makes us smile, is seeing someone else smile.” It’s the primary reason they named their employee volunteer program the “Care Program”, and employees take great pride in “caring” for the communities they live and work in. It is Purchasing Power's belief that by caring for the people in those communities, they are powering them to a better life. Turner’s employee volunteer program is strategically intertwined with the company’s philanthropic giving and employee engagement programs. The program includes 40 hours of additional paid time off to volunteer during work hours, up to $1,000 per employee in matching grants and volunteer grants, and a flexible virtual volunteer program targeting employees with non-traditional work schedules. In 2017, more than 2,600 Atlanta-based Turner employees logged roughly 200,000 volunteer hours with 200+ charities and were awarded over $600,000 in matching grants and volunteer rewards. The 20th Annual Corporate Volunteer Council of Atlanta IMPACT Awards were held on September 26, 2017, at the Delta Sky 360○ Club at Mercedes-Benz Stadium. Radio and television personality and founder of the Ryan Cameron Foundation, Ryan Cameron, emceed the luncheon for the third consecutive year. Neil Bush, Chairman of Points of Light, delivered the keynote address, preceded by an update on the transformation of Atlanta’s historic Westside communities from Frank Fernandez, vice president of community development at the Arthur M. Blank Family Foundation. Shannon Gerber, executive director of The Home Depot Foundation, also inspired the audience with an update about the work of Team Depot. 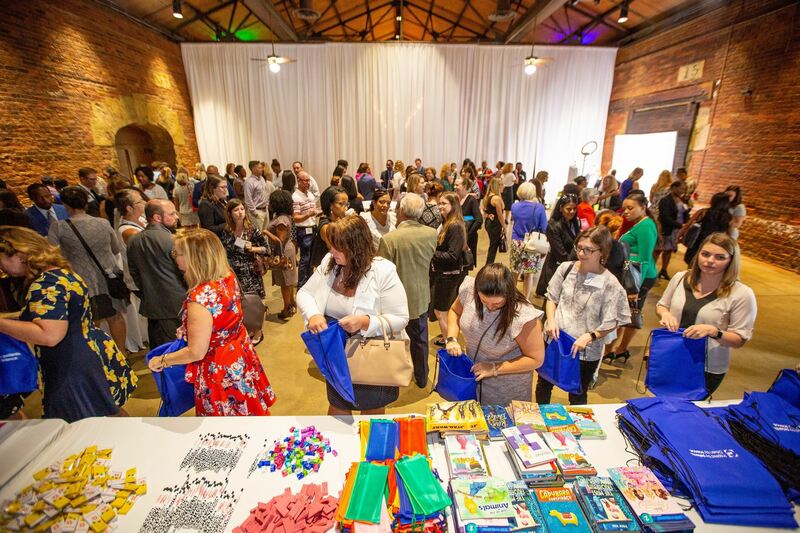 During the event, Hands On Atlanta hosted a literacy kit build where attendees put together 800 kits for students at Towns Elementary School. The Martin Luther King, Jr. High School drum line “Kings of Halftime” presented a riveting performance on the field to welcome attendees to the event. Please click here to view our full post-event press release. Thank you to the 400 guests who made this year's IMPACT Awards a sold-out success! Click here to view the entire photo album from the event, courtesy of Rank Studios. In 2016, 840 Delta Air Lines employees partnered with Atlanta Habitat for Humanity to build three new homes for Atlanta families in need. Four Delta project managers helped manage the projects in which volunteers invested 134,400 hours. Each of the homes was built with high-efficiency materials, lowering the carbon footprint of the building projects and aligning with Delta’s environmental pillar. One of these homes was completely paid for by dollars raised through Delta’s oil recycling program. 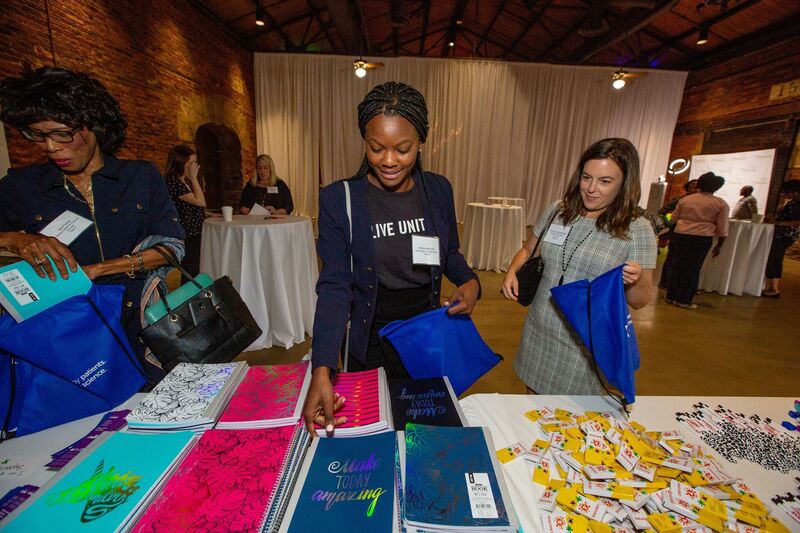 Deloitte’s skills-based volunteerism program helps accomplish business objectives by providing employees with learning opportunities that are directly applicable to their day-to-day client work. 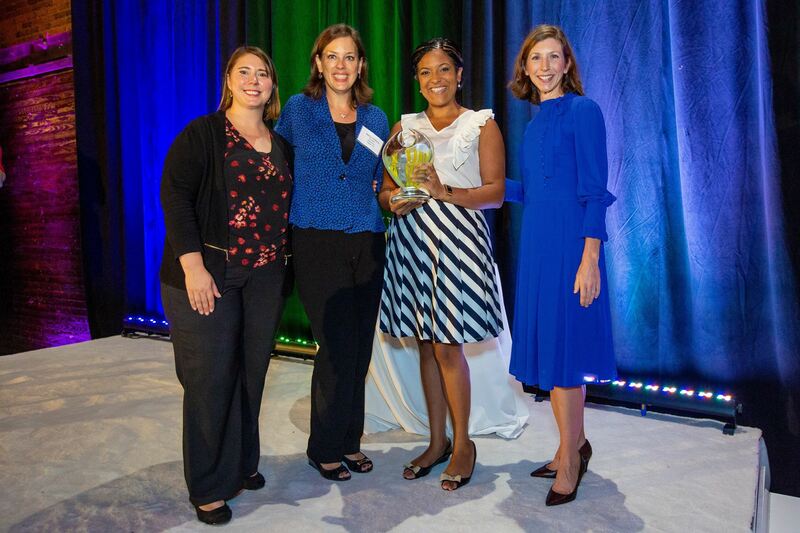 Deloitte partnered with Atlanta Habitat for Humanity to help the organization improve its measurement and communication processes in order to better connect with consumers, sponsors, and the community. In order to ensure that the goals of the project were fully realized, their team assisted with the implementation of a scorecard to better communicate its impact, and in turn, increase funding through donations and sponsorships in continued support of its mission. Last year, 11Alive partnered with Focus Brands and media production nonprofit, re:imagine/ATL to engage students from Grady High School in creating short videos highlighting youth homelessness and benefiting local nonprofit, The Atlanta Mission. The companies provided guidance in video production and meals while also supplying funding and professional support to the students. Volunteers contributed more than 60 hours to mentor students and help them find ways to amplify their message. Ultimately, this project has reached more than 500,000 with a call-to-action to help eliminate youth homelessness. Wells Fargo has partnered with Operation Hope, a nonprofit focused on financial dignity, education and economic empowerment, for 17 years. In 2016, they created a transformative, sustainable youth entrepreneurship initiative that harnesses the youths’ economic energy, and brings positive business role models into schools and communities. Through the program, students cover concepts necessary for starting a business, including competition, finances, marketing, and public speaking. Through this program, 95 employee volunteers worked with 690 students and 14 “pitch” students won grants for $500 each. Tower Beer, Wine and Spirits is a family-owned business that has been serving Metro Atlanta for more than 70 years. Community service and philanthropy have always been a vital part of the Tower culture. Just 16 months ago, Tower decided to formalize its volunteer efforts to provide monthly community service opportunities for employees in partnership with United Way of Greater Atlanta. In this short time, Tower has hosted more than 20 projects and had a 35% participation rate, despite the fact that the business is open seven days per week. In addition, Tower hosts an annual fundraiser for Children’s Healthcare of Atlanta that has raised more than $1 million in the past three years. Since 2012, Delta Air Lines has focused philanthropy and volunteerism around six key pillars including Education, Service Members and Veterans, Global Wellness, Arts and Culture, Global Diversity, and Environment. Delta follows a strategic plan focusing the company’s efforts on investing in business education, strengthening giving in Metro Atlanta, engaging more employees and more customers. Company highlights from 2016 include helping to build three homes, blood donation by 4,500 employees, 300 employees serving 9,000 hungry Atlantans in one day, and building the organization's fourth playground in Metro Atlanta. 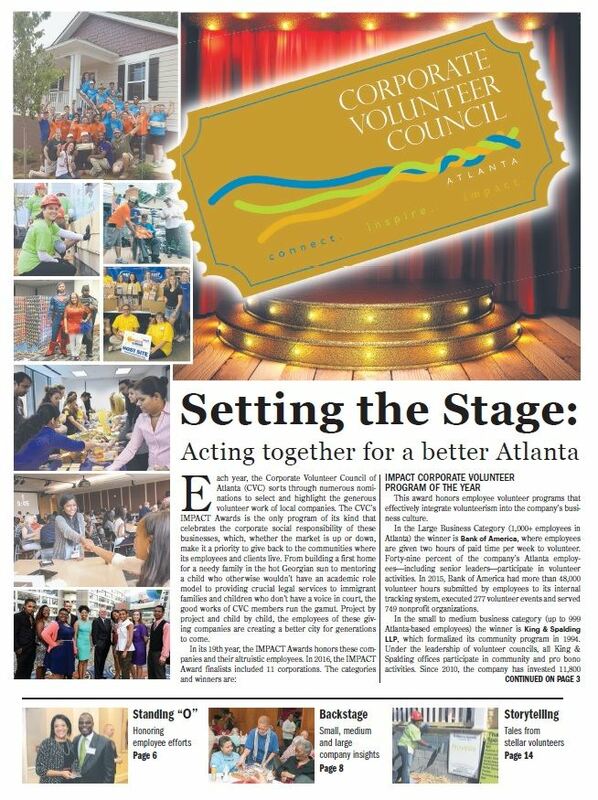 Click on the cover image below to view this year's special publication in Atlanta Business Chronicle highlighting all of our 2016 IMPACT Awards winners and finalists as well as all of the great work being done by CVC Members in the Atlanta community. The Home Depot is honored for its Introduction to Tools training for youth, ages 11 to 18. In 2015, The Home Depot was asked to provide volunteers for a pilot training at the Tool Training Center at the Atlanta Community ToolBank to introduce and train at-risk youth in basic tool skills . This was done by building a table, which was eventually distributed to military veterans and their families through another nonprofit’s furniture donation program. The pilot project, completed with the support of the Atlanta Community ToolBank, was a test for similar programs that could become ongoing training for hundreds of other youth in metro Atlanta. Today the training is being provided to 180 youth from the City of Atlanta’s Park and Recreation Department through their Summer Camp Program and being used with at-risk youth from CHRIS Kids in a south Atlanta neighborhood. Troutman Sanders is honored for its partnership with Atlanta Legal Aid Society to assist veterans in the Palliative Care Unit of the Atlanta VA Hospital with civil legal needs, including end-of-life planning documents such as wills, guardianships and more. Since January 2015, volunteer attorneys and paralegals have met with 60 veterans. The Immigration Working Group, a collaborative effort including Alston + Bird, King & Spalding, Kilpatrick Townsend, Sutherland and Troutman Sanders along with many other partners. This group was initially formed to help meet the growing need for legal services to assist unaccompanied immigrant children entering the U.S., but its responsibilities have grown to provide pro bono services to children, victims of raids, detention, deportation and the court case loads. Five law firms and 13 other entities are working to help solve a community challenge affecting an estimated one million residents in the state of Georgia. One of the IWG’s first outcomes was being able to bring KIND, a nonprofit that focuses their work on immigrant children, to Georgia. Turner and 21st Century Leaders are awarded for their partnership in a week-long program for 75 high-school students who are interested in careers in the broadcasting industry. The free-to-students program, launched in 2006, invites participants to live in nearby dorms and travel to Turner offices each day for workshops, panel discussions, networking opportunities and more. Since the program’s inception, more than 1,000 students have participated. King & Spalding formalized its community program in 1994. Under the leadership of volunteer councils, all King & Spalding offices participate in community and pro bono activities. Since 2010, the company has invested 11,800 hours through 395 community service projects and provided 93,000 hours of pro bono service to low-income individuals, nonprofits and community causes in Atlanta. At Bank of America, employees are given two hours of paid time per week to volunteer. Forty-nine percent of the company’s Atlanta employees—including senior leaders—participate in volunteer activities . In 2015, Bank of America had more than 48,000 volunteer hours submitted by employees to its internal tracking system, executed 277 volunteer events and served 749 nonprofit organizations. 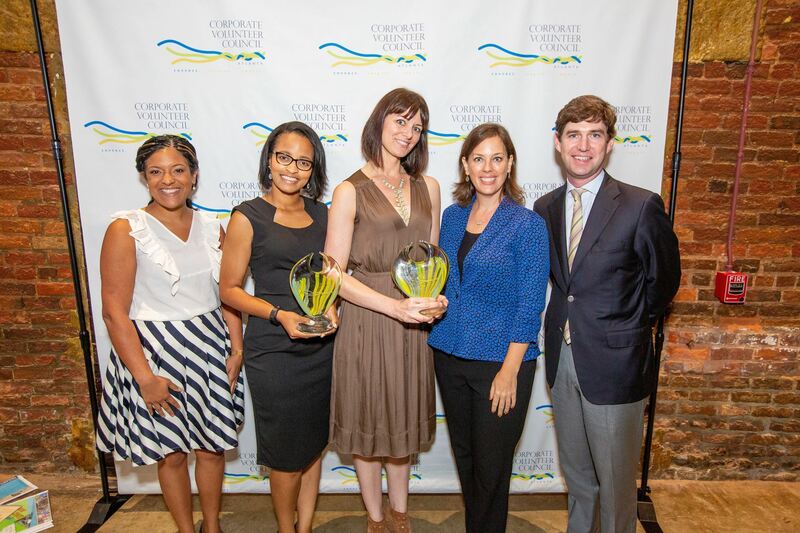 The Corporate Volunteer Council of Atlanta Celebrated the 2015 IMPACT Awards on October 7 at the Delta Flight Museum. 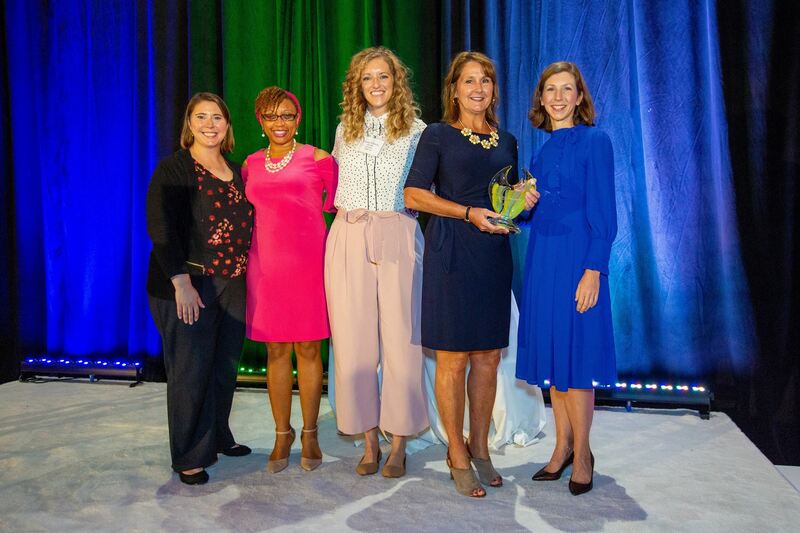 We invite you to click on the cover below to learn more about our IMPACT Award winners, finalists and the great work that Atlanta companies are doing to make the connection and help Atlanta soar. This supplement published in Atlanta Business Chronicle on October 9. 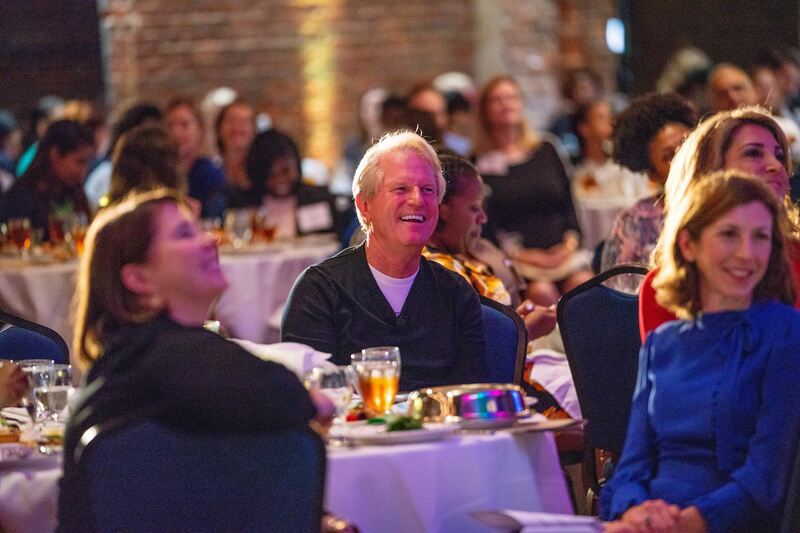 The IMPACT Awards honor for-profit companies, businesses and firms that recruit and activate volunteers to serve the Atlanta community and/or exclusively utilize Atlanta-based volunteer resources. 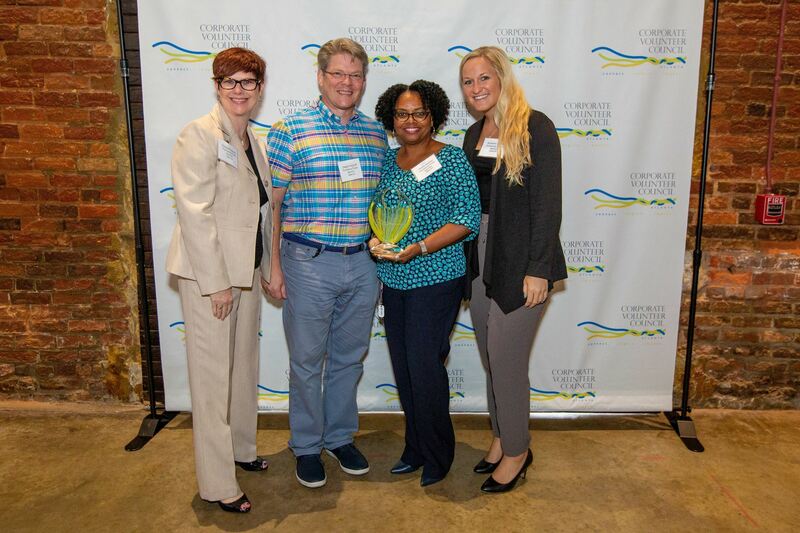 Nominations are accepted each spring and following the judging process in the summer, winners are announced at the annual IMPACT Awards and showcased in Atlanta Business Chronicle in the fall.